This image of Copernicus was acquired on the Lunar Orbiter 5 Mission. Copernicus is 93 kilometers wide and is located within the Mare Imbrium Basin, northern nearside of the Moon (10° N, 20° degrees W.). Image shows crater floor, floor mounds, rim, and rayed ejecta. 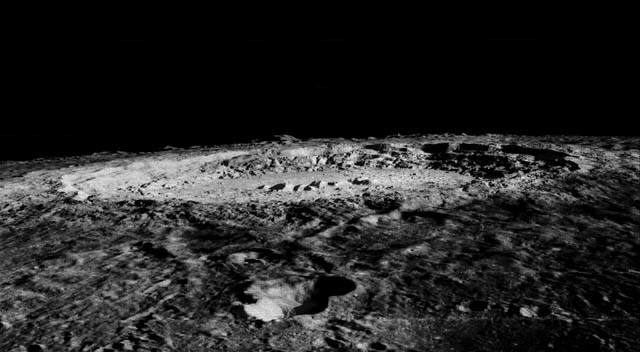 Rays from the ejecta are superposed on all other surrounding terrains which places the crater in its namesake age group: the Copernican system, established as the youngest assemblage of rocks on the Moon (Shoemaker and Hackman, 1962, The Moon: London, Academic Press, p.289-300).